It takes a special breed of runner who races in marathons. It takes an even more special breed who prefers ultra-marathoning. So what should we make of those elite runners who sign up each year to compete in the Badwater Ultramarathon -- a 135-mile endurance-fest that begins in Death Valley and finishes on Mt. Whitney? Oh yeah--the non-stop race is held in July when temperatures typically hover in the 120-degree Fahrenheit range. Because Mary Gorski, 45, is an adrenaline junkie, she felt drawn to Badwater. After crewing for other runners the previous two years, Gorski, who is the communications director for a non-profit organization in Milwaukee, decided to pursue ultra-running's Holy Grail. Last summer, she flew out west and competed in Badwater. She recently spoke with RailRiders about her experience. To beat the heat and sun, Mary and her four-person support crew all wore RailRiders' Eco-Mesh Shirts. RailRiders: How did you train for a desert race in Wisconsin? Did you run on a treadmill in the sauna? Mary Gorski: It is vital to practice for the heat. Your body adapts to it. I did try to overdress for workouts (wool hat, jackets, pants) but often this just made me sweaty and once I was sweaty in 60-degree weather, I just got chilled. What was more beneficial was sauna training. Starting six weeks out I tried to get in the sauna at least five times a week at the local YMCA. You can literally feel your body adapt. Initially at 160 degrees F my heart rate would shoot up to 125 just sitting still. This was only 15 minutes into the sauna time. I'd also get a very edgy feeling. After three weeks, however, my resting heart rate following 45 minutes at 160 degrees would be about 92 F. I was relaxed and would simply enjoy the time by reading a magazine. One change I had to make -- I wear reading glasses and had to get plastic frames. The metal ones burned my nose in the sauna. I also avoided air conditioning in my home and car, and often drove (at the end of the day when I didn't have to worry about how bad I smelled) with the heater on. Badwater also has some long climbs -- this surprises a lot of people who expect a flat desert. At about 44 miles there is a 17-mile gradual climb, and then again at 72 miles you have about a 15 mile ascent. This is all before you get to the Portal Road -- 13 miles, uphill, that leads to the 8,371 foot-high finish line. To prepare for the climbs it makes sense to prepare to walk uphill expediently. Few people in a 135-mile race can run the whole thing. It makes sense to walk the hills, or at least part of them. But there is a huge difference between walking a 14-15 minute mile and a 20-minute mile. If you don't practice to walk fast you won't do so in a race. I practiced on hills outside, and on treadmills set on inclines. RR: Any other tips for the Badwater-bound novice? MG: The most important tip for a novice is to crew the race before you consider entering. One of the most valuable things I did in preparation was crewing. It really gave me a sense of what the event was all about, how far a person could push himself or herself and how to re-group when the body rebels. And to be even considered for Badwater, one needs to have done prior long-distance events of 100 miles or more. This ensures that the entrant has some background in long-distance running. Certainly, this type of preparation is needed regardless of what kind of weather you can do the training in. You need time on your feet. Most people use shorter races as build-ups to Badwater. For instance, each month prior to Badwater -- starting in January -- I did a race of 50 kilometers or longer. Included was a 50-mile trail race and a 100-kilometer road run. The road running is essential -- Badwater is a pavement run. Most long-distance runners in the United States prefer trails. The pavement can be intimidating so you need to get used to it. RR: Briefly describe your athletic background prior to Badwater, and what got you interested in ultra-running? MG: I was a band geek and newspaper junkie in high school and college, I didn't get involved in sports until my early 20s. I am now 45. Initially, I found a nice spot in the back of the pack at local five-kilometer runs. Eventually, those distances increased as did my speed. In 1985 I did my first triathlon. For several years I was on the Vic Tanny Triathlon team. During that time I earned a number of age group wins, as well as top-ten placings in triathlons throughout the Midwest. Ironman races that I have done include Hawaii, Lake Placid and the inaugural Ironman Wisconsin in Madison. In recent years, my athletic focus has been on long-distance running. I have completed several 100-mile races and dozens of 50-mile and 50-kilometer runs. Some I have done quite well in, placing in the top 10 at the National 50-Mile Trail Championship, winning master's awards and even taking the overall female trophy home from a couple of events. Competition is fun, but basically, I just like to play outside. During the winter, I participate in cross-country ski events in the Midwest and Canada, including the American Birkebeiner (largest cross-country ski race in North America), the Gatineau Loppet (Quebec), and Noquemanon (Upper Michigan). I've done several mountain biking events, including the Chequamegon Fat Tire in northern Wisconsin. I kayak, backpack, ice skate and even do a bit of mountaineering. Among the summits I've reached: Mt. Rainier, Mt. Baker and Mt. Shasta. RR: What were the most difficult and challenging parts of Badwater? MG: For me, it was fatigue. This was exacerbated by a personal tragedy just a few days before the start of the race -- a good friend of mine was killed by a drunk driver while out on an easy bike ride. I watched as nurses removed her life support and she quickly died. The idea of unning 135 miles across Death Valley suddenly seemed so silly and meaningless. What was the point? But I went through the motions anyway, as many of us do in the midst of tragedy. Thursday morning I watched Nancy die. Friday morning I was at the Milwaukee' airport, waiting for my flight to Vegas. Leaving one surreal situation for another. I hadn't slept much in the days prior to race start and I think it just all caught up with me at the end of the first day at Badwater. I was exhausted and literally struggling not to fall asleep on my feet. Overall, I suffered no joint pain, no significant blisters (I had just one) and no serious stomach discomfort (a frequent problem for long distance runners). But I was just so tired. I have never been so tired in my life. RR: What were some of the emotional highs you experienced? MG: Simply starting the race with about 85 other runners at Badwater, which is 282-feet below sea level and is the lowest point in North America. I hugged my crew and other friends, got to the starting line, stood to listen to the national anthem and then we were off. It felt so good. I was smiling and giggling the first two miles. I was so happy to be there, so happy to be part of the event, so happy to have good friends who sacrificed personal time and resources to be there with me. Making it to the road that leads to the town of Lone Pine -- the last major checkpoint in the race -- was another big high. I had gone through a tough period of fatigue and I had gotten pretty crabby at that point. Once we hit the road I knew I was close to the end. Two miles later we were at the checkpoint and I felt like a princess as people tended to me. I knew that all we had to do was hike those 13 miles up the Portal Road and we would be done. Finally, I loved coming across the finish line with my four crew members. It was so corny. We sang "If You're Happy and Your Know It Clap Your Hands" as we ran in. It was such an emotional rush. We did it, and we did it well within our time goals. I was giggly with elation (probably punch-drunk with fatigue as well). It was such an incredible feeling to have worked together as a team to reach our goal. I felt so close to the people who helped me, including not only the crew but the race staff. I felt a strong connection to other finishers. It was literally a high. I have to say though that after all the hugs were done and pictures taken it was kind of a weird feeling. For months I had worked up to the moment of finishing and then I had. It was one of those "So, now what do we do" moments" -- I had never thought beyond the finish. Finally, I realized that all you do is head back down the mountain and enjoy some well-earned sleep. RR: How did your support crew assist you along the way? MG: First, they took a huge burden off my mind by attending to just about every detail. (See photo, from left to right: Bonnie Busch, Scott Jacaway, Stephanie Astell, me, and Nikki Seger.) I relaxed in my motel room while they organized the gear and worked out plans for the days ahead. It was such a relief to just turn myself over to them. During the race they met me approximately every mile to give me nutrition, check on my medical status (occasional weigh-ins, etc. ), and find out my needs. They also tried to give me advice. In the beginning, this centered on telling me to slow down. I went out too fast but felt so good running that I just couldn't help myself. They were right though. I'm sure that my quick beginning was a part of my fatigue later. After the first checkpoint -- about 17 miles into the event, the runner can have a pacer. This person is basically company for the runner. Most of the time I took advantage of this. All of my crew people took turns pacing me. RR: Did you ever feel like quitting, and if so, how did you push on? MG: There were times when I felt like the race would never end, but I never seriously thought about quitting. I never feared not being able to finish. You have 60 hours to complete the event. That's really a good chunk of time to go 135 miles. You can walk most of the course and still finish. As a first timer, this was my goal -- finishing. I hoped to go under 48 hours (which I did -- I broke 46) but was prepared to go for 59:59 if that was needed. Having plenty of time was a nice reassurance. RR: What are some of the other competitors like? Where are they from? RR: How did you deal with the heat? MG: You just accept it. I knew that I was well-prepared from my sauna training. It takes a few minutes after walking out into the desert heat to adjust to it, but that is probably more mental. Your heart rate is normally higher in the high temperatures, so you have to adjust your pace. You need to make sure that you are well hydrated, and your crew is vital in monitoring this. During most of the daylight hours I ran with ice in a bandana against my neck. Food intake is also less in the worst of the heat -- the runner takes in more liquid fuels and things that sit in the stomach easily. It's hard to digest things when you are really hot. My food tastes varied during the race. I ate everything from peanut butter and jelly on a tortilla to Oreos, sports gels, chips, crackers, apples with peanut butter, squash soup (really! it was great at night), and Jello cups. Unfortunately, we weren't too careful when we bought the Jello -- it ended up being my favorite thing to eat but about halfway into the race we realized that we had purchased diet Jello. It tasted great but there was barely any nutritional value to it. As I came into Lone Pine -- just before the final 13 miles up to the Whitney finish -- I had a cheeseburger from MacDonald's. After a couple of days on my feet, the burger really hit the spot. I also drank a lot of HEED (sports drink), Gatorade, Perpeteum (another sports drink), cola and 7UP. 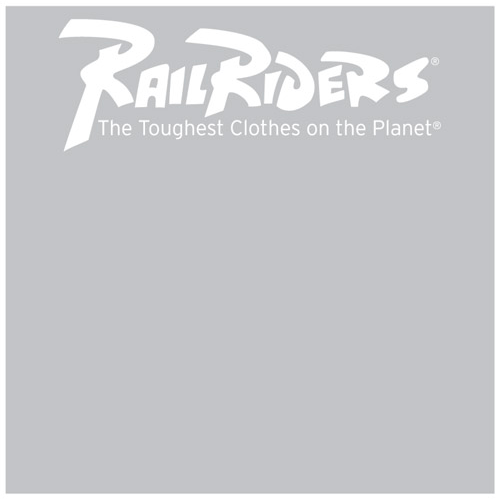 RR: How did the RailRiders clothing hold up? And why did you choose them for the race? MG: In the worst heat of the day I ran fully covered. This seems counter-intuitive, but I've tried both running with bare arms and sunscreen in the desert heat, and in arms and legs lightly covered and no sunscreen. For me, with very light skin, running with light covering is much better. Certainly, the RailRiders Eco-Mesh shirt was a big help. My whole crew wore them, and I have worn them previously when I crewed. The shirt has great ventilation. It covers the arms but doesn't feel restrictive, clammy or hot. In fact, there are no signs of wear on the shirt from this year's race or on a shirt that I've had for the past three years. I got a lot of dirt on the shirt but it always cleans up well. At 42 miles into the run, I dove into a motel swimming pool to cool off, keeping my RailRiders shirt on so that it could get a nice washing. After wearing a reflective shirt for the night portion I wanted to switch back into my RailRiders shirt for the next day's running. My crew said that they just laid the pool-soaked Eco-Mesh shirt on the van and it dried in minutes. RR: Your legs and feet must have taken a beating in Death Valley, and so, how did you deal with this? MG: They did take a beating, but not nearly as bad as I expected. Part of my success was using B�r shoes. The shoe company was a sponsor and gave each of the competitors a pair of its shoes to try. I thought that they looked funny but with the wide forefoot and just overall nice fit they were perfect. I only had one blister. The worst that my feet got was the day after climbing Mt. Whitney. We finished the race at about 6 a.m. on Wednesday, and about 24 hours later we returned to do the 22-mile up and back climb to the top of Mt. Whitney. Again, I felt better than expected but that night my feet swelled quite a bit and I was very uncomfortable. I soaked them in cool water and eventually they were more tolerable. RR: Any final thoughts about Badwater? MG: The race is significant to ultra-runners for several reasons. First, it is an incredible challenge. The distance is tough (135 miles). It's on a long road that, in some people's minds, just goes on forever. And generally, it is in extreme heat. Many endurance athletes are looking for that next "bigger thing." Once they've done a marathon, they wonder if they can do a 50-kilometer or 50-mile race. Once that is done, perhaps they can do a 100-miler. And then a 100-miler on a challenging course. 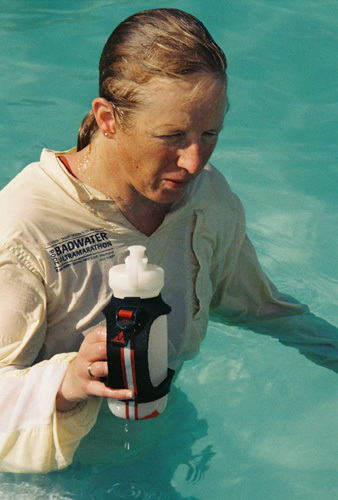 There is a real popularity in extreme sports right now and Badwater feeds into that. It's a part of the answer to the eternal question of "how far can I push myself?" Once a person has been to Badwater, I think there is also something beyond the athletic component of the race that hooks people. There is an incredible beauty to the desert -- more so than most people realize. There is also an incredible sense of family among staff, competitors and crews. 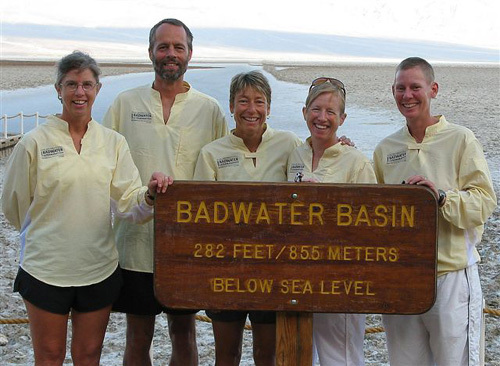 Organizers refer to the "Badwater Family" but it isn't just a gimmick -- it's real. There is a sense of family.